As the nights become darker and cooler TV seems to be getting back into its stride again as we head into the autumn months. One indicator that we're hurtling towards Christmas at an alarming rate is that The X-Factor returned this week for its twelfth series. There have been plenty of alterations to the show this time round most notably the departure of judge Louis Walsh and host Dermot O'Leary. 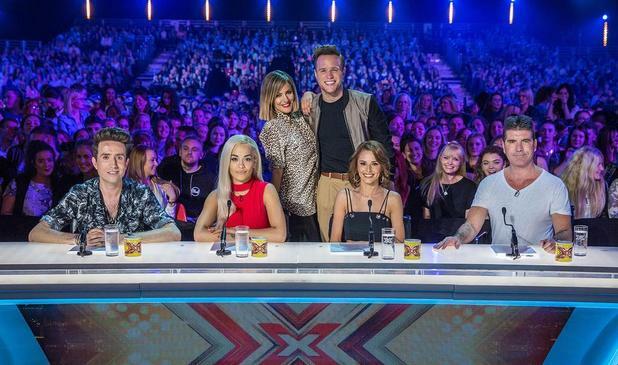 It did seem that in hiring a group of younger hosts and judges that The X-Factor would have a certain freshness about it that it hasn't had for the past few years. Unfortunately the youngsters he decided to surround himself with include gormless Radio 1 presenter Nick Grimshaw and the outline of Cheryl Vernandez-Versini. The one good move this year is the appointment of the likeable and talented Rita Ora to the panel however I kept feeling like I wanted to save her from the horrors that were to come. Teaming up with Cheryl, Rita and Grimmy; Simon felt like a spare part for the majority of the opening two episodes. In fact he felt like the divorced dad who'd been dragged out by his kids to the nightclub and then had to watch stony-faced whilst they danced around stupidly. There was in fact a lot of dancing in the opening episode which to me felt like the producers were trying to enhance the fun nature of the new judging panel but instead made the show seem even more down market than it normally is. Meanwhile I do feel it's too easy to judge the job done by new hosts Olly Murs and Caroline Flack as they were almost obsolete at this early stage of the game. Whilst I do think it's unnecessary to have two hosts, the pairing are both likeable in their own right and so hopefully will do a good job when called upon. However we've already been given course to sympathise with Murs after his former bandmate suffered a rather tepid reception following an underwhelming audition. In fact, despite him being the host rather than one of the acts, I think Murs' reaction following his mate's audition was possibly the most memorable moment of the opening episode. 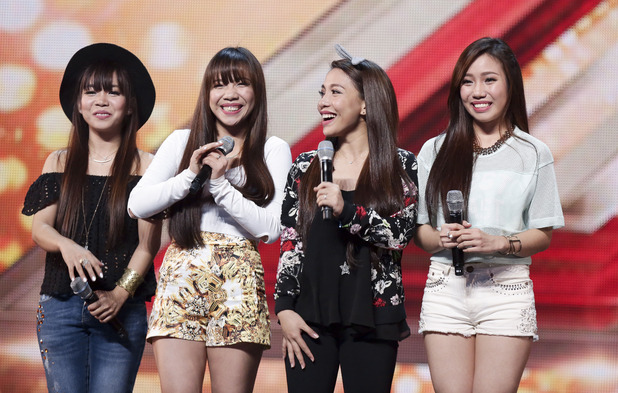 In terms of the talent, The X-Factor gave more of the same mix of rather good acts mixed with some of the clichés that have been the calling card of the talent show over the past eleven years. First auditionee Susan Pryce was a perfect example of this as she sung a woeful version of 'No Limit' only to be voted through by the judges who were clearly winking at the audience at home. The other thing that irked me was the fact that the judges basically picked what songs the acts would perform after being given a list ahead of the audition. This essentially turned the acts into a life-size jukebox with the judges in control of picking the selections. To be fair there was some decent over the nights, most notably Filipino girlband 4th Power who I initially thought were something that Simon had ordered from the internet. The fact that the acts are allowed to bring dancers on in their auditions also helped jazz up this stage of the competition with boy band The First Kings giving a lively rendition of 'Uptown Funk'. However the mediocre overruled the exceptional and the endless of treadmill of decent but unmemorable singers who were trying to fulfil their life long dreams just showcased how tired this format is. Even a rather emotionally tinged performance of Labrinth's 'Jealous' from the talented Josh did really hit me in the same way that it did the judges. Unfortunately for Josh his singing talent will be overshadowed by the fact that Simon broke down in tears during his audition and thus taking all the attention away from a potential finalist. Crucially the ratings for The X-Factor's return were very poor, and that's even before Strictly Come Dancing returns next week, which shows to me that nobody will be convinced to return to a show even if the line-up is different. I think The X-Factor's flagging ratings show that there isn't as much desire for the talent show format as there was a decade ago. I do feel that producers need to start finding that next Saturday night hit as, judging by the opening two episodes alone, The X-Factor is on its last legs. Airing after Sunday's episode of The X-Factor was ITV's new three-part drama The Trials of Jimmy Rose which stars Ray Winstone as the eponymous career criminal. When I first saw that Ray Winstone was fronting a gritty crime drama I thought he'd be bashing people over the head with baseball bats and using a lot of fruity language. Instead I was quite surprised by the fact that Jimmy Rose was portrayed as a man whose life had passed him by and the respect that his family and friends had for him had disappeared. In fact his wife Jackie (Amanda Redman) had fallen out of love with him whilst his son Joe (Tom Cullen) wanted nothing to do with him. Jimmy's biggest struggle though was his attempts to rescue his heroin-addicted granddaughter Ellie (Montanna Thompson) from some unsavoury characters. What I liked about Alan Whiting's drama were the moments in which the once powerful Jimmy discovered that the modern world had passed him by. His struggles to use a smart phone felt realistic whilst the scene in which he was informed that he can no longer use money to pay for a bus journey was another moment that rang true. It was these moments that made the drama hang together and I enjoyed them a lot more than I did the more clichéd sections of the piece. 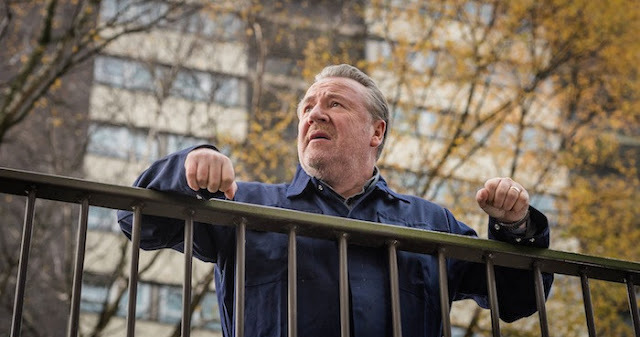 The one element of the drama I'm conflicted is Ray Winstone's performance as I felt he was both a blessing and a curse to the overall programme. On one hand Winstone is a charismatic performer, has great chemistry with leading lady Amanda Redman and is a name that will attract viewers to a drama they previously had no interest in. However I don't feel as if Winstone nailed the subtlety of Whiting's script and I feel that in the hands of a more diverse actor The Trials of Jimmy Rose would've been something special. That's not to say I didn't enjoy myself whilst watching the first episode, which I found to be well-paced, I just feel that Winstone may have been the wrong person to call upon for a drama which requires a lead actor who can delivered a layered rather than a one-note performance. 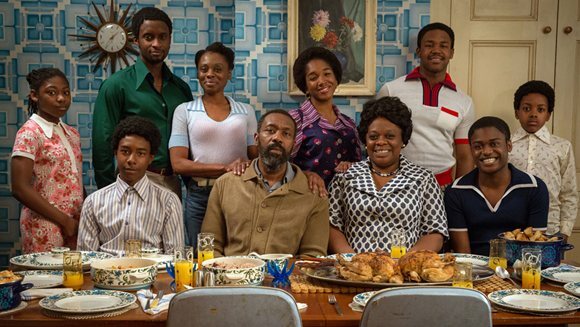 This week's other big drama Danny and The Human Zoo also had a big named attached to it in the form of Lenny Henry who served as both writer and supporting actor. The ninety minute feature focused on Henry's first flushes of fame and his attempts to the rather racist landscape of 1970s Dudley. Danny (Kascion Franklin), is the dramatic version of the young Henry; who was regularly abused for the colour of his skin but found his voice by impersonating other people. At some points Danny and the Human Zoo resembled the stereotypical biopic as we saw Danny's struggles with his family, the bullies and the unscrupulous entertainment industry. However the fact Henry was writing the script meant that everything felt authentic and he made you sympathise with several of the key characters. The latter part of the drama painted Danny in an incredibly sympathetic light as he was forced to be part of a touring version of The Black and White Minstrel Show something that he hated doing. Danny's lowest moments were excellently scripted and ended with a rather poignant moment in which Henry got to write the conversation that he never had with his own father. The only element of the drama which I felt was a little weak were the moments that dealt with Danny's love life namely his relationship with a possessive Irish barmaid (Evanna Lynch) and the potential romance he could have with his neighbour Cherry (Leonie Elliot). While he wrote an enjoyable script I think that Henry's best contribution to the piece was his performance as his own father Samson. His turn as the quietly stoic patriarch of the Fearon clan was possibly the drama's best and made me hope that we see Henry in more serious roles in the future. Also worthy of praise is Franklin who perfectly anchored the drama with a performance that allowed the audience to sympathise with Danny's various personal traumas. Although there was very little new about it, I really enjoyed Danny and the Human Zoo and felt it was perfectly scheduled on Bank Holiday Monday. Ultimately this was a biographical drama that was full of heart, humour and one that was bolstered by a well-paced script and a fantastic central turn. But Danny and the Human Zoo wasn't the only biographical show based on a national treasure this week as BBC Two started airing the eight part adaptation of Danny Baker's autobiography Going to Sea in a Sieve. Like Danny and the Human Zoo, Cradle to Grave was also set in the 1970s as we watched the teenage exploits of a young Danny Baker as he attempted to navigate adolescence. Although this was essentially the story of the teenage Danny (played here by Laurie Kynaston) most of the screen time was eaten up by his father Spud (Peter Kay). Spud was written as the stereotypical sitcom patriarch who was always after the next scheme whether it be selling embalming fluid as Schnapps or stuffing his house full of continental quilts to sell to the neighbourhood. The problem with Spud's stories is that they tended not to fit into the rest of the episode meaning that Baker and co-writer Jeff Pope had to shoehorn them. In was this almost anecdotal narrative that spoilt Cradle to Grave for me as it felt like a sketch show about Baker's life rather than a pure half hour comedy episode. Attempts to tie all the stories together by incorporating a trip to the theatre to see 'Hair' didn't really work even though the musical scene itself did provide the episode's biggest laugh. 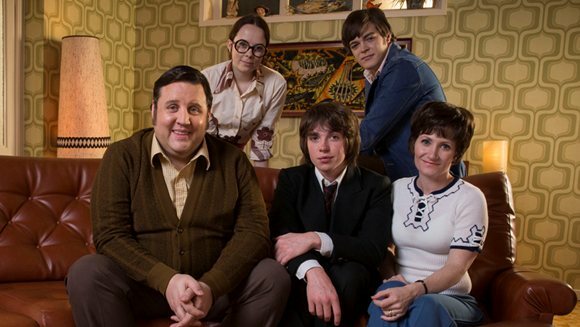 The other issue I had with Cradle to Grave was the casting of Peter Kay in the lead role of Spud. Although I understand that getting a big name helps to attract viewers, proud Northerner Kay playing old school Londoner Spud didn't ring true. The fact that Kay was struggling with the accent led him to almost shout all of his lines and in the process turned what could've been a rather realistic 1970s dad into a comedy caricature. It's a shame because underneath all the mess there were decent glimpses of a coming-of-age comedy about a youngster who wasn't quite sure of his place in the world. I have to admit than whenever Laurie Kynaston was on screen by himself Cradle to Grave was at its strongest. However the over-reliance on the larger-than-life Spud and the fragmented narrative meant that Cradle to Grave had a rather confused tone which meant that I could never fully relax into it. The same isn't true for the show accompanying Cradle to Grave for BBC Two's new prime time comedy line-up on Thursday nights. 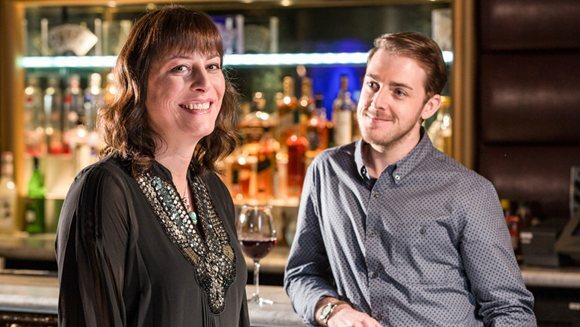 The show in question is Boy Meets Girl, which started life as the winning script in a competition to find a comedy that portrayed transgender characters in a positive light. The majority of the press I'd read about Boy Meets Girl focused on the casting of real life transgender actress Rebecca Root and how groundbreaking the show was fore featuring her in a prominent role. So I was more than surprised to learn that Boy Meets Girl was rather a traditional romantic comedy that used Root's Judy's gender transition to explain why she's been so lonely for most of her life. Creator Elliott Kerrigan and co-writer Simon Carlyle made sure that Judy and her love interest Leo (Harry Hemple) both felt like well-rounded characters and by the end of the first episode I felt I'd got to know them sufficiently well. Crucially both Judy and Leo were likeable and relatable characters whose romance made sense despite the fact that she was significantly older than him. Any of the scenes in which these two characters were on screen together were incredibly warm with the majority of the comedy stemming for realistic situations. Both Hemple and Root were brilliant in portraying Leo and Judy as lonely characters who were looking for love and who had seemingly found it with one another. If Boy Meets Girl does have any negative qualities then its in the supporting characters most notably Leo's annoying brother James (Jonny Dixon) and his overbearing mother Pam (Denise Welch). However I feel that Kerrigan and Carlyle have time to let us get to know these characters a little more as the series progresses and I'm not going to judge his presentation of secondary characters too harshly in an opening instalment that had plenty of plot to whiz through. When it's at its best Boy Meets Girl evokes memories of Gavin and Stacey and whilst Kerrigan's comedy may not be as laugh-out-loud funny as that comedy classic its certainly as warm and genuine. I'm just hoping that Boy Meets Girl gets better as it goes on as after episode one I already think it might be one of my comedies of the year. We end this week on something a little bit different with Channel 4's latest fixed rig documentary The Catch. The programme focuses on a number of different fishing boats and their crews who risk life and limb just to earn a living. First up was the Govenek of Ladram, a Cornish Boat whose captain Phil makes a tricky decision after the price of their original catch is devalued quite quickly. Phil and his team make their way into quite a nasty looking storm primarily to catch more fish and ultimately make a tidy profit. Between The Catch and The Tribe it appears as if Channel 4 is taking the rig documentary in a different direction and I really like it. Here the cameras do a brilliant job of making the audience feel like they're on the boat and I have to admit that I almost got a bit squeamish watching the show. It was fascinating seeing the crew slipping and sliding around the boat as they made their way further into the storm. However the visuals wouldn't be anything without a compelling story and the first episode of The Catch had in the form of trainee Louis' first time on the ship. Louis was a brilliantly endearing character who had been home-schooled by his mother and had never really found either a proper job or a group of friends. However, even though he was mocked and cajoled by the rest of the crew, by the end of the journey it seemed he made a fair few chums and had already been asked by Phil to do another trip on the Govenek. 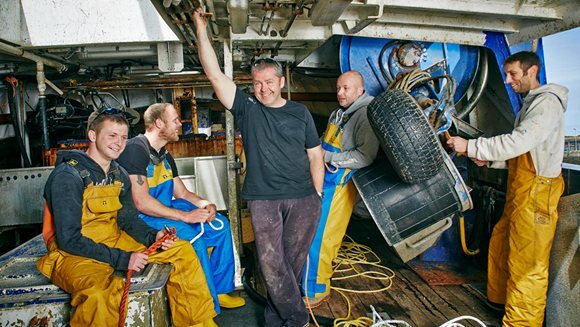 The combination of the family atmosphere and the dangerous conditions made The Catch a compelling watch and it certainly stacks up well against Channel 4's other brilliant factual programmes. I'm already looking forward to the next episode, I'll just make sure that I've got my sea legs on this time around.